“Violence is to be avoided, and Ninpo is Bujutsu”. “Use the sword to be peaceful, and protect country, family, and nature”. A four pointed throwing star, the design of which is exclusively unique to the Togakure Ninja. This is a short bamboo tube 4 foot long (1.20m) used to aid in breathing when hiding under water. It was also used as a blowpipe. Sometimes a broken scabbard was put to use as an underwater breathing apparatus also. Another Togakure Ryu weapon is Tetsubishi with 9 spiked ends, which are sometimes thrown like shuriken. Gotonpo (5 ways of escaping) was the most secret of all the Ninja arts. 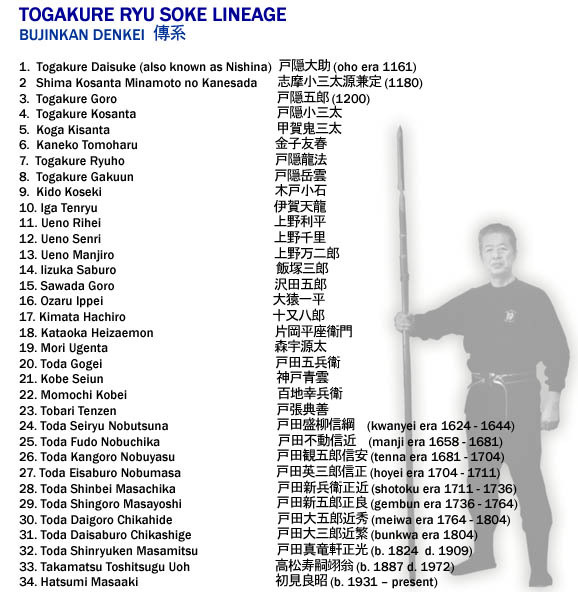 In the Togakure Ryu there are 12 forms (called the Tonko no Jutsu), which have been handed down since the time of the 4th Soke. The philosophy behind the Gotonpo is based in Gogyo and in the densho these secrets are only mentioned, not really gone into in any detail.